The College of Physicians and Surgeons designates this live activity for a maximum of 6.25 AMA PRA Category 1 Credits™. Physicians should claim only the credit commensurate with the extent of their participation in the activity. Nurses and physician assistants are encouraged to check with their accrediting organization to ensure they accept AMA PRA Category 1 Credits™. This one-day CME accredited course will educate clinicians about new therapies available for patients including the use of cell transplantation for the repair or replacement of organs, immunosuppression in transplantation, immunologic suppression and the progress of pancreatic islet and cellular transplantation. Surgical and medical education are critical in the role of innovation and determining which patients may benefit from specific therapies. This activity is designed for physicians and surgeons including: cardiologists, diabetologists, hepatologists, immunologists, infectious disease specialists, internists, nephrologists, radiologists and transplant surgeons, as well as, medical and surgical residents and students, nurse practitioners and physician assistants. Take the 1 or A or C lines to 168th Street – Washington Heights/Broadway. Parking is available at the NewYork-Presbyterian/Columbia University Medical Center parking garage, located on the southwest corner of Fort Washington Avenue and West 165th Street. Parking fee is NOT included with registration. Valet parking is available at the entrance of the Milstein Hospital Building located at 177 Fort Washington Avenue. 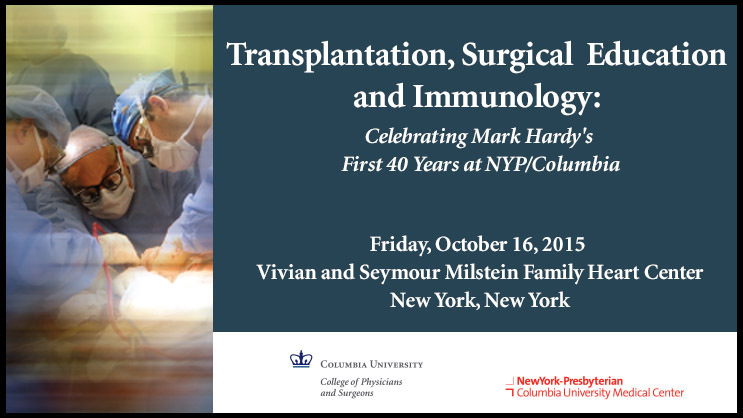 For questions, please call Jessica Scully at 212.304.7817 or email at jas2134@cumc.columbia.edu.